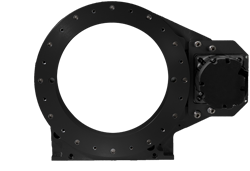 For applications with continuous rotation or high fidelity requirements, select a ring encoder option. Tape scale encoder options are best suited to applications with non-continuous rotations less than 360º. A normally closed sensor is a fail-safe sensor. When the sensor is actuated the circuit opens. Likewise if a wire were to be cut, the system would stop. We run both the PNP and NPN Sensors as normally closed. This is a switched Negative output. A permanent positive voltage source will be connected to the device that is to be activated and the other side of the circuit is connected to the NPN sensor’s output. When the sensor is triggered, the output of the NPN is 0 volts. Therefore the device is also pulled to ground, thus completing the circuit. This is a switched Positive output. A permanent negative voltage source is connected to the device that is to be activated with the other end of the circuit connected to the PNP sensor’s output. When the sensor is triggered, the output of the PNP is a positive voltage. As a result, the device’s circuit is completed. A read sensor is triggered to close when it experiences a magnetic field. When there is an absence of a magnetic field, the stiffness of the reed causes them to return to their original open position.